Until recently, Amazon's Appstore for Android has been the only game in town when it comes to (legally) obtaining paid apps for free. Getjar has changed that, however, by beginning the Getjar Gold Program which offers an entire catalogue of paid apps absolutely free and without ads. It would seem that Getjar's new program is a huge success, at least in the case of one development company. 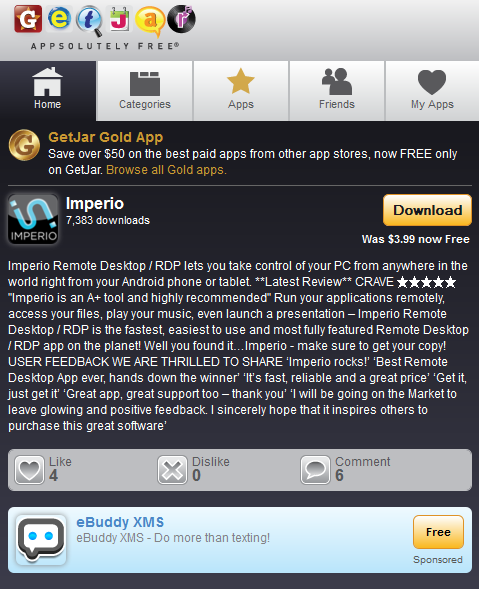 Mobisoft, developers of Imperio RDP remote desktop client, released a press statement recently reporting on the company's experience thus far with Getjar Gold, boasting "three times the revenue" in its first week as part of the program over revenue generated by the Android Market. Chris Drury, Getjar COO, expressed his enthusiasm regarding Imperio's successful experience with the program. "GetJar Gold was designed to meet everyone's needs: consumers get a great deal and developers get paid. We are thrilled to see the user and revenue growth for Imperio, as it shows that GetJar Gold is a superior model for the industry." 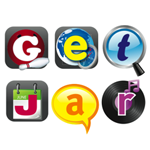 Getjar, the popular market alternative, benefits users, developers, and their own revenue with its Gold program, offering high-quality, ad-free apps for users, per-diem payment for developers who offer their apps for free, and an adsense-like system of revenue generation in which other developers bid on per-install prices for installs generated by sponsored listings. This success story makes Getjar's Gold program all the more appealing, proving that their innovative model is actually working for all parties involved. As the program progresses, it will be interesting to hear more reactions from developers and representatives of Getjar regarding the effectiveness of the bold new program.